Pakkaus sisältää 8 kpl 17ml maalipurkkia. Set of 8 Model Air colors in 17 ml. bottles. 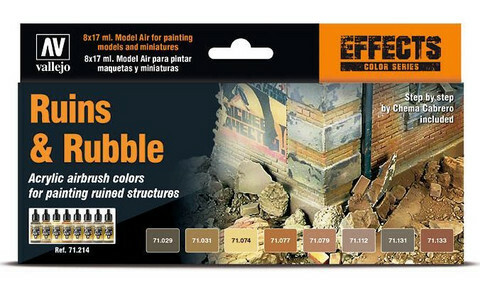 Selection of eight Model Air colors, especially formulated for painting buildings and unpaved roads; ruins, rubble and stone floors or tiles, as much for city as for rural environments. Step by step by Chema Cabrero included.